of what is found there." 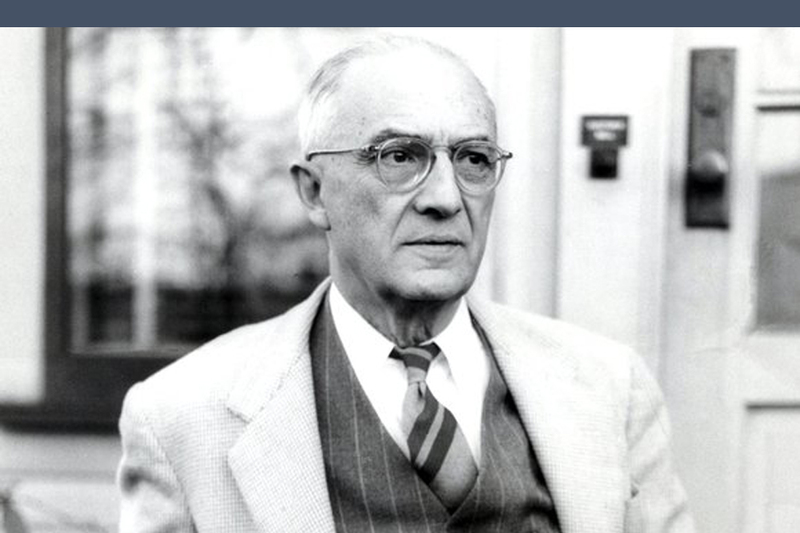 William Carlos Williams (1883–1963) was a revolutionary figure in 20th century American poetry, all the more for his absorption in ordinary life. A poet from high school on, he decided to be both a writer and a medical doctor. At the University of Pennsylvania, he joined friends Ezra Pound and Eliza Doolittle in the "Imagist Movement", with its stress of "swift, uncluttered, functional phrasing" and "direct treatment of the thing". Williams chose to articulate ordinary conditions around him in poetry, conditions perhaps less ordinary than most as seen from the perspective of a doctor treating birth, death, and the lives between. 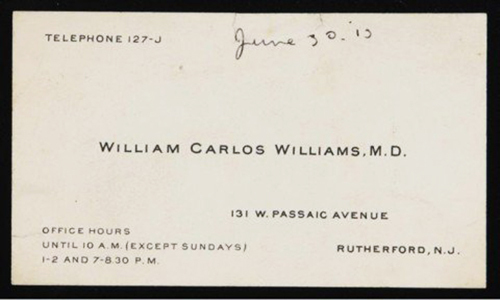 "I was determined to use the material I knew," Dr. Williams said, as reflected by his humanity both in his 40 years of private medical practice in Rutherford, New Jersey, and his poetry reflecting the vernacular of the American voice. To quote verbatim from the excellent article from The Poetry Foundation: "...Williams heard the 'inarticulate poems' of his patients. As a doctor, his 'medical badge,' as he called it, permitted him 'to follow the poor defeated body into those gulfs and grottos..., to be present at deaths and births, at the tormented battles between daughter and diabolic mother.' From these moments, poetry developed: 'it has fluttered before me for a moment, a phrase which I quickly write down on anything at hand, any piece of paper I can grab.' Some of his poems were born on prescription blanks, others typed in a few spare minutes between patient visits. Williams's work, however, did more than fuel his poetry: it allowed him 'to write what he chose, free from any kind of financial or political pressure. From the beginning,' disclosed Linda Wagner [Interviews With William Carlos Williams: "Speaking Straight Ahead," edited and introduced by Linda Welshimer Wagner, New Directions, 1976], 'he understood the tradeoffs: he would have less time to write; he would need more physical stamina than people with only one occupation.... [He] was willing to live the kind of rushed existence that would be necessary, crowding two full lifetimes into one,... learning from the first and then understanding through the second.' There is little doubt that he succeeded in both: Richard Ellman and Robert O'Clair called him 'the most important literary doctor since Chekov'". The poem Paterson began as a single poem in 1926 and ended consisting of five volumes and the prelude to a sixth cut short by Dr. William's death in 1963. Discussing the poem, Williams wrote "that a man himself is a city, beginning, seeking, achieving and concluding his life in ways which the various aspects of a city may embody—if imaginatively conceived—any city, all the details of which may be made to voice his most intimate convictions." Paterson perhaps gained Williams the most pre-mortem recognition, and he became a non-establishment inspiration for poets Allen Ginsberg, Doris Levertov, Robert Creely and others of the "Beat Generation" of poets. William's most important gift, he felt, was the "variable foot—the division of the line according to a new method that would be satisfactory to an American." His mastery of the sound of poetry echoing the sound of America and its speech, literal and metaphorical, was no less important. Despite failing health throughout the 1950's, Williams wrote prolifically, while traveling, speaking and entertaining the Beat poets in the same rooms he had entertained the Imagists years before. Finally in 1963, the year of his death, Dr. William Carlos Williams was awarded the Pulitzer Prize for his last book, Pictures From Brueghel. Kora in Hell: Improvisations (1920) - Prose-poem improvisations. The Great American Novel (1923) - A novel. Spring and All (1923) - A hybrid of prose and verse. In the American Grain (1925), 1967, repr. New Directions 2004 - Prose on historical figures and events. A Voyage to Pagany (1928) - An autobiographical travelogue in the form of a novel. White Mule (1937) - A novel. Life along the Passaic River (1938) - Short stories. In the Money (1940) - Sequel to White Mule. The Build-Up (1952) - Completes the "Stecher trilogy" begun with White Mule. Imaginations (1970) - A collection of five previously published early works. The Embodiment of Knowledge (1974) - Philosophical and critical notes and essays.